I don’t think I’ve ever been so thankful for a three-hour stretch of sleep. Although John sleeps at night (thankfully! ), he’s ready to eat every couple of hours or less. Which I’m grateful for because nursing Nathan was such a struggle! So anyway, I’ve gotten him back to sleep so I’m going to try to do the same thing myself. Maybe I’ll get another three-hour stretch. If he can stop grunting. The past few nights, little fellow grunts all… night… long. He’s doing it right now. I’m not sure why; he seems to be ok so it must be a newborn thing. And I’d rather him grunt and make noises and know he’s ok than to worry all night because he’s so quiet! So good night and let’s hope I can snag some good sleep. You know, in a lot of ways, having a second baby is easier than it was the first time around, especially with a four-year age gap. For example, when John cries, I already know what to do. Is he hungry? Dirty diaper? Hot? Cold? Overly tired? Need to be in a different position? Does he just need to be held while he let’s off steam? With Nathan, it was incredibly anxiety-provoking when he cried because we didn’t know what to do. And it didn’t help that I nursed Nathan on a schedule (as the hospital told me) rather than on-demand. This time around, however, I’m nursing when John wants to nurse. I think that’s helping keep John a little happier and it should keep my supply up as well. Another plus is the age difference. Nathan is old enough to help with little things… bringing me my cup, throwing away a diaper, picking stuff up for me, etc. It’s nice to have an eager helper! 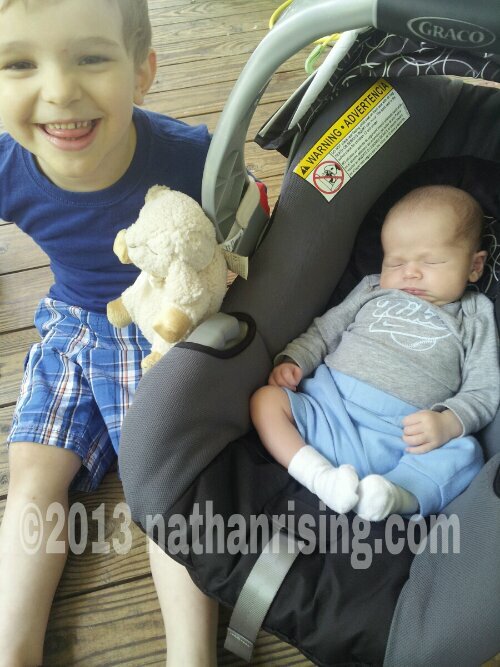 He loves being a Big Brother, and he’s very attentive to baby John. Whenever the baby cries, Nathan bounds over and asks John what’s wrong, if he wants more of Mommy’s milk, if he has to go potty, etc. He’ll pat and kiss John’s head and tell him not to cry because everything will be just fine. Nathan is very careful arond the baby. When he touches or pats John, he does it so tenderly. Nathan gave us a scare yesterday though. We were sitting down eating dinner and we had John in the kitchen with us. Towards the end of our meal, the baby started fussing. Nathan got up from the table and checked on John (who was right beside me). 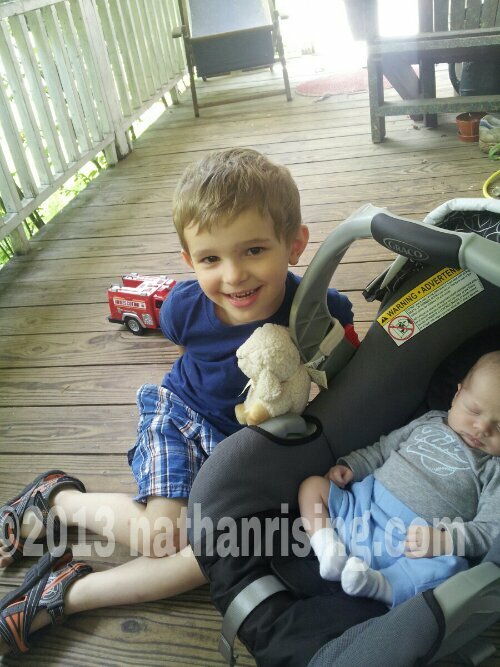 I smiled and turned my head to eat another bite of food, and to my shock, when I turned back around to look at my boys, Nathan had picked John up and was holding him out to me! I don’t think a spoon has ever flown out of my mouth so fast. My heart rose into my throat and before my flying spoon had time to clatter to the floor, I had gently scooped the baby out of Nathan’s caring embrace. I told Nathan that he’s such an awesome big brother for being concerned about the baby, but since the baby isn’t big and strong like Nathan, he can’t pick him up unless he asks first and we help him. Then I gave my sweet boy a hug. I don’t ever want him to feel like he’s not “allowed” to touch or help the baby- but at the same time, he doesn’t understand how fragile a newborn is so he has to dote on him with supervision for now. My goodness, how I love that sweet boy. In other ways, it’s harder adding a second kid to the mix. I still have one to take care of. I can’t sleep whenever I want or need, even if the baby is up all night and I’m dead tired. That’s the biggest part so far is not being able to rest like I could when I only had one child. But that’s just fine. I keep reminding myself that this stage doesn’t last long at all. It’ll be gone in the blink of an eye, and I don’t want to wish it away. I sure do love my babies and want to enjoy this time with them. So I bet you are wondering how my current pregnancy is going. Well, it’s going great! I mean, I don’t FEEL great, but the pregnancy itself is good; baby boy is healthy & very active! I’ve not had any medical problems thus far, thank God. My only woes are physical, the kind that come with a typical, healthy pregnancy. Like my poor back, especially my lower back. My tailbone aches something awful, but my midwife tells me it’s due to the hormone Relaxin produced by my body; it relaxes my joints and bones, and so my tailbone has started to shift. It’s incredibly painful to sit, and even more painful to go from a sitting position to a standing one. But I know it’s just part of being pregnant and it won’t last forever. I also sometimes have a hard time catching my breath, but that’s because my growing baby is pushing up on my lungs, compressing them. Plus I have 50% more blood volume in my body. I’ve noticed that working out helps with my shortness of breath tremendously though! Those are my main physical gripes. I’m also incredibly tired this time around. I remember being tired and fatigued when I was pregnant with Nathan, but I didn’t have children already, so I could rest and nap when I needed. Not so much now! My eyes burn a lot from being so sleepy, and having bouts of insomnia at night only exacerbates the problem. Little baby boy has some strong kicks, which I love, but he keeps me awake at night! Plus it’s hard to get comfortable. So I end up tossing and turning, and I feel so exhausted by the time morning rolls around. Being pregnant with my second child is definitely different from the first! But, with all that being said, this pregnancy is all-in-all MUCH easier than Nathan’s. His was awful. I ached horribly, down to my very toes. I could baely walk, and couldn’t stand up without help. I attribute all that, however, to being physically inactive. I didn’t exercise one bit because I had no idea the toll pregnancy takes on a woman’s body, and I paid for my laziness with a lot of muscular and skeletal pain. I also gained over 60 lbs, which added even more pressure to my already stressed joints and bones. It was awful. This time around, however, things are different. I’m extremely healthy and don’t gorge on foods just because I’m pregnant. I work out 3-4x a week, and I still weight train to keep my muscle tone. My midwife told me whatever I do, do NOT stop working out. Since I had been exercising strenuously for 1 1/2 years before I became pregnant, my body was used to it, therefore it was good for both me and the baby. Now I’m not some body builder or anything… I just do the weight training to stay tone. Now that I’m 25 weeks along, I’ve had to cut back some since I fatigue easily, and I don’t do any actual lifting or anything that could put strain on my uterus. And this time, I’m right on track with my weight gain! At the rate I’m going, I will have gained exactly the amount doctors and midwives recommend for a healthy pregnancy. Which feels really damn good. Especially when a number of people have insisted pregnancy will make me “pack on the pounds.” Nope, not here! I’m in better shape now than I was when I was in my early 20’s. I look fabulous, feel pretty good for being pregnant, and am so grateful that this pregnancy has been much easier than Nathan’s thus far. This time around, I am seeing a midwife and giving birth at a freestanding birthing center as opposed to seeing an OB/GYN and giving birth in a hospital. I’m sure there are plenty of women who have had great experiences with a medically managed birth, but that’s what I had with Nathan and it was AWFUL. I’ll talk more about that in another post. Suffice it to say that I believe OB/GYNs are great for those times when a pregnancy developes medical issues. But in normal, healthy pregnancies, going the medical route is overkill. Using interventions, in my experience, is a slippery slope which has the potential for serious outcomes for both the mother and baby. After such a horrible birth experience with Nathan, I am actually really looking forward to this one. They do things there the way I’ve instinctively felt birth should be for a long time… I think the difference is going to be night and day and this time, I won’t feel so helpless and unheard but instead strong and empowered.